Unfortunately there was no sign of the Green-winged Teal on Potter Brompton Carr (no general access) during the day but Teal numbers had increased to 54, also present were 3 Shelduck the Shoveler, 173 Lapwing and 23 Pied Wagtail. The highest day total of Whooper Swan was beaten today, with birds past Long Nab and on Wykeham South Lake totalling 64, interestingly the previous highest day total of a mere 37 was set back on the 7th March 2011! At Wykeham South Lake the 19 Whooper Swan were still present with 92 Wigeon and 7 Goldeneye also there, at Long Nab there were 4 Red-throated Diver, 23 Curlew, 6 Guillemot, 2 Meadow Pipit and 2 Lapland Bunting, a Shelduck, 5 Wigeon and 10 Mallard were on Flotmanby Carr, 70+ Teal were on the river east of Ruston Carr Bridge, 7 Common Scoter and a Guillemot were in South Bay, 2 Ringed Plover and a Dunlin were on Cayton Carr and 15 Siskin were in Falsegrave Park. 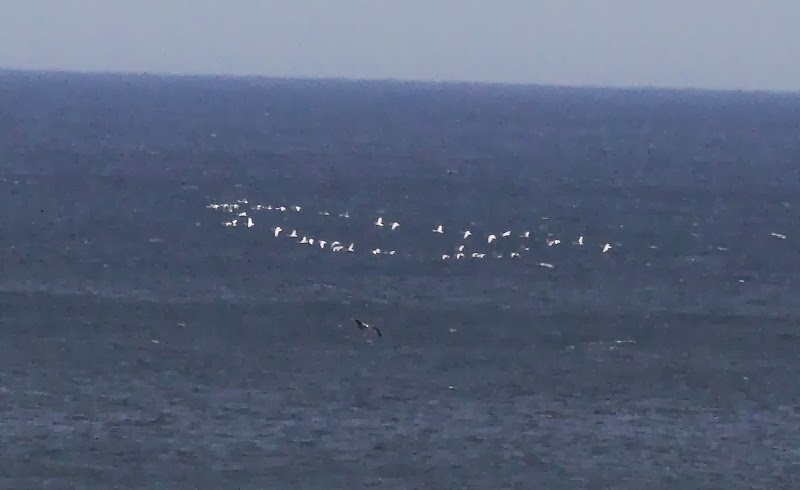 On the move (south unless stated) were 7 Red-throated Diver + 5 north, 9 Fulmar + 3 north, 92 Gannet, 7 Cormorant + 6 north, 45 Whooper Swan north, 6 Teal, 1 Common Scoter + 1 north, 1 Goosander, 4 Curlew, 4 Black-headed Gull north, 2 Common Gull + 4 north, 5 Lesser Black-backed Gull north, 158 Herring Gull, 16 Great Black-backed Gull + 7 north, 1 Kittiwake, 2 Guillemot, 2 Auk sp + 16 north, and 2 Alba. Late news was received of a Great Grey Shrike in Sieve Dale, Dalby Forest along with a Goshawk, 3 Fieldfare, 6 Siskin and 3 Crossbill.